Home Enjoy Life When Work and Ministry Meet. Today we are continuing focus from yesterday. If you missed yesterday’s post, you may want to check this out first: Maximize the Overlap Between Gifts, Work, and Calling. Let’s take a look at David, the young shepherd boy, out on the hillsides tending sheep and fending off lions and bears. God used his experiences as a young boy to teach and train David to courageously fight in defense of others. Through the daily experience of fulfilling his responsibilities, he learned to be confident in both God and himself. Through his work, God developed the heart of a servant-shepherd as David learned to act decisively when a threat is present. Shepherding prepared David to answer God’s call to defend God’s name and fight the giant Goliath. Call rose up out of a heart passionate for God, out of the indignation that anyone would insult the Living God. In essence, God used David’s experience and training to play a vital role in fulfilling God’s call to lead the nation of Israel. When we are faithful to follow God in our daily responsibilities and vocational work, He can prepare us to use our gifts and experience to accomplish His purposes. What if David had not seen the connection between what God had trained him to do in the past with the need before him in the present? What if David had thought his skills only applied to defending sheep? Remember that herding sheep was one of the most lowly professions–not the stuff great heroes were known for. What is God doing in your life, through your life experience, your training, your gifts, and your calling? Do you see the overlap in your life? For a long time I kept thinking of spiritual gifts only in terms of teaching Bible study and ministering directly to the body of Christ. I had my life neatly organized into separate boxes–personal, professional, spiritual. Now, when I teach my water fit classes, I ask God to make my work a blessing to those in my class. I bring the same prayerful desire to bring the presence of Christ into all that I do. I ask God to use me to encourage and motivate my clients to aim high and work hard. This is my friend Dasha Gariepy. 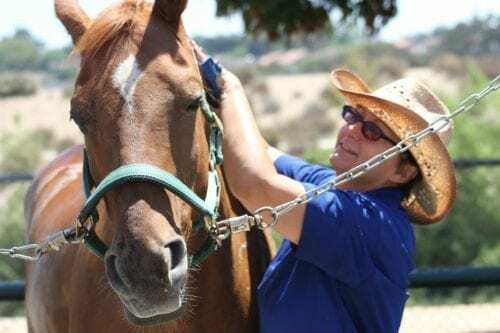 An avid horse women and a fun blogger, Dasha has found that sweet spot of joy in sharing her experience and heart for ministry in a non-church setting. She volunteers at Dream Catcher of L.A. Therapeutic Riding Centers. Yesterday she posted these awesome pictures that show this dynamic, joyful place where gifts, calling, work, and ministry meet. Click on Dasha’s name to visit her blog. What has happened in your world when work and ministry meet? Calling, spiritual gifts, WORK. Bookmark.